Marblehead Village Council consists of the Mayor, the Clerk and six council members. One council member is appointed Mayor Pro-Tem. Meetings are held on the first floor of the fire station. The regular Council Meetings are held on the 2nd and 4th Wednesdays at 6 pm and the Finance Committee meets at 5:30 pm prior to both regular meetings. See where your tax money is being spent with the Village of Marblehead's transparent public funds information. The Board of Public Affairs conducts their meetings on the 2nd Tuesday of the month at 7 pm at the Water Plant. The Planning Commission of Marblehead regulates and promotes the proper arrangement of streets, lots and safe vehicular traffic including access for emergency. The Commission plans for recreation and other open areas including public facilities. The Planning Commission assures the orderly development of land to achieve a harmonious and stable community including provision for water, sewer and other health facilities. The Commission coordinates land use and development in accordance with the Marblehead Zoning Ordinance and the Marblehead Subdivision Regulations. The Planning Commission of Marblehead meets on the 1st Wednesday of the month at 6 pm at the Fire Department. The Zoning Administrator regulates and interprets the Marblehead Zoning Ordinance for the incorporated areas of the Village including the location, size, height and use of buildings. The Zoning Ordinance provides a number of districts to provide for the health, safety and economic stabilization of the Village and its residents, and prescribes penalties and procedures for the enforcement of the Ordinance. Zoning hearings are conducted on an as-needed basis and are advertised in advance. The Finance Committee meets the 2nd Wednesday of each month at 5:30 pm prior to the council meeting held at 6 pm. The Finance Committee meets in the Village Chambers. The Village Maintenance/Street Department is responsible for all village roadways. This includes general maintenance, repairs and snow plowing as needed. This department is also responsible for upkeep of James Park and Clemons Cemetery. The Village Street Commissioner Bryan Lucas oversees this department, which consists of a part time and a seasonal employee. Trash removal is at the homeowner’s expense. The local Yellow Pages can be checked for available services. 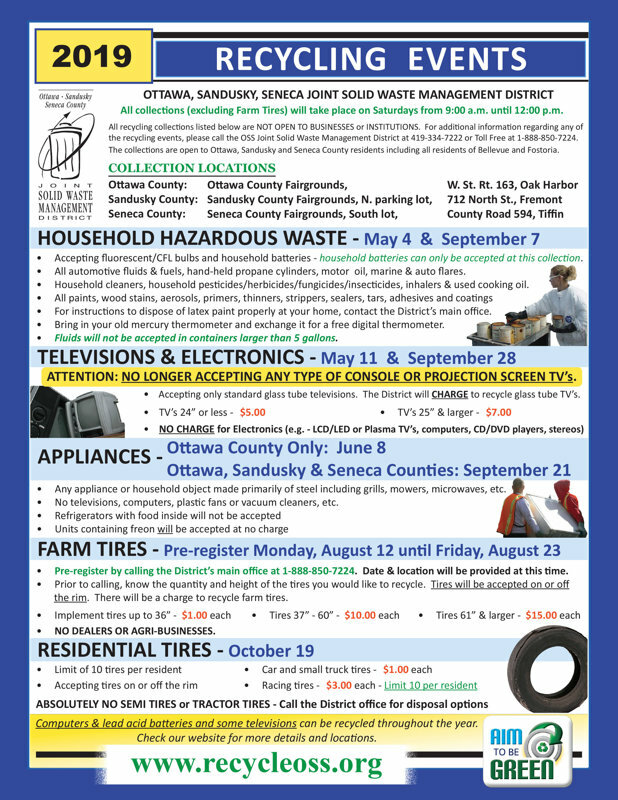 Ottawa County provides sewer service to the Village. Marblehead provides fall leaf collection to the Village annually. See the local newspaper for collection dates. The Marblehead Fire Department and the Lakeside Volunteer Fire Department have been consolidated into the Danbury Fire Department. The Fire Chief is Keith M. Kahler, the Fire Prevention Officer is Doug Waugh, and the Station Phone number is 419-798-5219. The Marblehead Police Department currently consists of our Chief, three full-time officers and one part-time officer. The Marblehead Police Department protects the lives and property of the citizens, enforces laws, prevents crime and educates the public. We perform these duties with honesty and fairness. Through strong leadership and continuous training, we will strive to serve as role models for the community, applying professional standards and commitment to integrity, sensitivity and compassion to those we serve. The Marblehead Water Department was formed with the passage of Ordinance No. 12-1958. Village Council set into motion the building of a municipal waterworks system for Marblehead. The village waterworks has been in continuous operation since 1959 serving the residents with high quality water for over 45 years. The first Board of Public affairs was appointed on November 28, 1958. Members were Joseph Kristenak, President; and Steve Meterko and Charlie Myers. The board has seen many others elected to the position over the years including Robert S. Boytim, the longest serving elected official in Ottawa County. The first plant superintendent, Franklin Merrill, was appointed on July 16, 1959 and remained in this position until retirement in 1988. Over the years many changes have occurred including two annexations which added demand to the system and a plant expansion to satisfy the demands. The 2004 EPA required plant expansion has been completed ensuring a constant supply of quality water for our future. The Board of Public Affairs and the Water Department are proud to be part of service to our community providing safe, high quality water 365 days a year. Current BPA Members are President Bob Boytim, George Danchisen and Lyn App. Help keep our community safe by reporting streetlight or outdoor area light outages. If the light presents a hazardous situation, such as broken glass, danger of falling, or exposed wires, do not complete this form. Immediately call 1-888-LIGHTSS (1-888-544-4877).